Click chemistry has emerged as an established method to link functional moieties with each other. This concept is especially interesting for the preparation of functional materials such as block copolymers. To date, most publications deal with the well-explored azide-alkyne click chemistry. Our approach uses the inverse electron-demand Diels-Alder (iEDDA) reaction. Here, an electron deficient diene (for example, a tetrazine) reacts with an electron-rich dienophile to form a Diels-Alder adduct which is then (due to extrusion of nitrogen) converted into a pyridazine. Due to its fast reactivity and bioorthogonal nature, this reaction has already been utilized for bioconjugation in various contexts (also in vivo) and, more recently, also been applied in polymer and materials science. This research branch was finanzed from 2012 until 2016 by a Herta Firnberg grant awarded to Astrid C. Knall. A typical example for the potential of iEDDA in material science is the highly efficient post polymerization functionalization of a DCPD derived polymer foam with dipyridyltetrazine (Knall, et al. Chem. Commun. 2013). "A trifunctional linker suitable for conducting three orthogonal click chemistries in one pot." "Kinetic studies of inverse electron demand Diels–Alder reactions (iEDDA) of norbornenes and 3,6-dipyridin-2-yl-1,2,4,5-tetrazine." 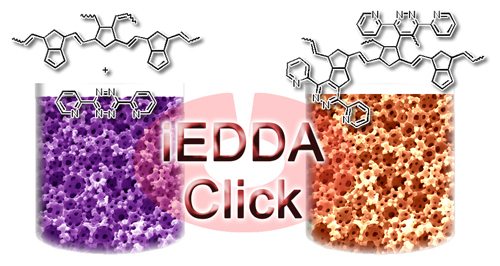 "Inverse-electron demand Diels Alder (iEDDA)-initiated conjugation: a (high) potential click chemistry scheme." Knall, A.-C.; Slugovc, C. Chem. Soc. Rev. 2013, 42, 5131-5142.